Initially the exact location of the underground leak was unknown at the Bladensburg Bus Depot. GMS excavated a trench approximately 20′ long, 8′ deep up to 6′ wide in order to expose the damaged 12” water line. The pipe was cut in order to remove the leaking section and was replaced with around 20’ of 12” ductile iron and then tested for leaks. The work was performed over a weekend to limit disruption to the site which is an active bus depot with vehicles needing access at all hours. 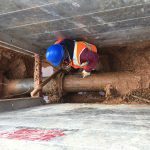 A dewatering pump was provided throughout the performance of the work and we ensured onsite safety of all workers and customer personnel by installing steel plates over the exposed pipe prior to backfill and replacement of asphalt and concrete; and by using trench boxes. Once the work was complete, GMS performed site restoration and stabilization for the customer.